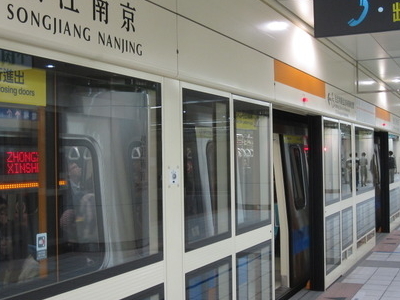 The Taipei Metro Songjiang Nanjing Station (Chinese: 松江南京站; pinyin: Sōngjiāng Nánjīng Zhàn; Pe̍h-ōe-jī: Siông-kang Lâm-kiann Chām) is a station on the Xinzhuang Line located in Zhongshan District, Taipei, Taiwan. It is a planned transfer station between the Xinzhuang Line and Songshan Line. 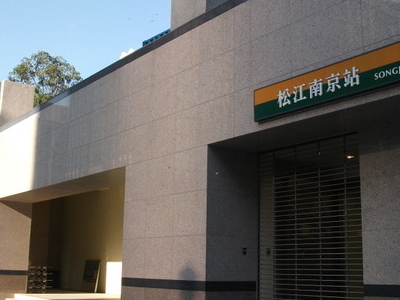 The station opened on November 3, 2010 for traffic on the Xinzhuang Line, while Songshan Line services are scheduled to commence by December 2013. This underground station has an island platform and will have two side platforms for the Songshan Line. It is located beneath the intersection of Songjiang Rd. and Nanjing East Rd. (hence the name of the station), and opened in November 2010 with the opening of the Luzhou Line and the Taipei City section of the Xinzhuang Line. Also, the MRT planners expect this station to be part of the Minsheng-Xizhi Line. 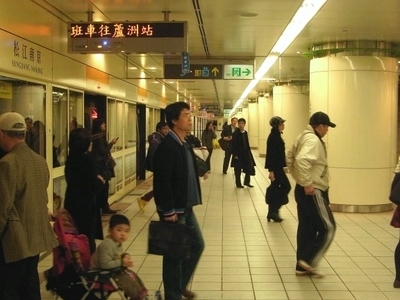 The theme for the Songshan Line station will be "Metropolitan Images of Daily Life" (都會眾生相). It will use four elements (earth, fire, water, wind) to present surreal situations of the combination of city and nature. Here's the our members favorite photos of "Railway Stations near Zhongshan". Upload your photo of Songjiang Nanjing Station!